I recently built a 36" Speed 400 sports plane and got around to thinking how I could operate two ailerons from a single servo using the RDS system. I figured that two light wire output rods could be splayed apart and connected to both ailerons and because the relative angular directions of the rods in the pocket were opposite, it should produce opposite travel on each of the ailerons. Two lengths of 1/32" wire drive rods are soldered into a 1/16" ID brass tube. At this stage the 45 degree bends are not made on the drive shafts. Two 1/32" ID tubes are installed in the trailing edge of the wing at 45 degrees as shown in the drawing and photos. The distance between the servo and trailing edge should be such that the splaying apart of the two drive rods does not cause too much stress on the wires. 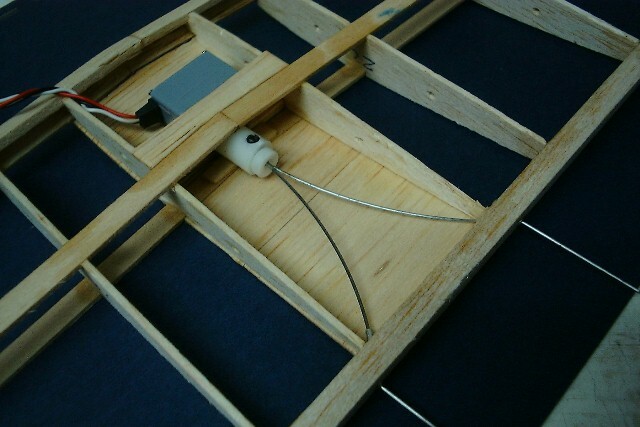 The wires are passed through the tubes and the servo and RDS driver installed. 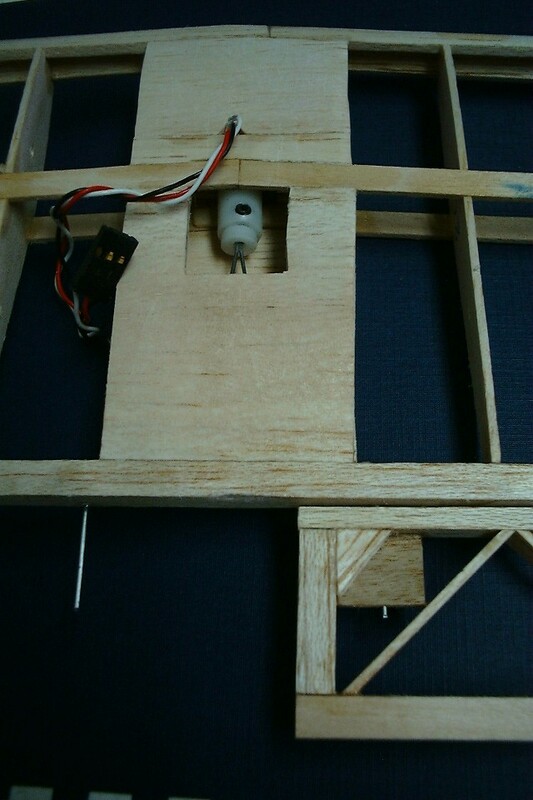 Set up the servo in the neutral position and clamp the output shaft in the RDS. The rods at this stage should be coming out of the trailing edge at 45 degrees. Carefully bend the 45 degree angle in the rods so that they are pointing back at 90 degrees to the trailing edge. The photo below shows the set-up with one aileron installed and the centre bay sheeted. I had enough confidence in the set-up to fully sheet in the servo, just allowing a small access hole for adjustment. The wing on the right shows the actuator rod in the aileron pocket. The details of the installation are shown in the Adobe Acrobat drawing linked below. I had some reservation initially as to whether the system would work due to the possibility of over-stressing the servo due to the splaying out of the rods. I also was not sure that the rods would operate smoothly, while still retaining the ability to rotate the part in the pocket. At first I used 0.025" wire for the rods, which worked fine except it was a bit "flexy" and there was too much spring in the ailerons. On changing to 1/32" wire everything worked well and there was still no noticeable stresses on the servo (in this case a 9 gm FMA S90 servo). I have been very pleased with the results and it is a simple way of installing a very lightweight two aileron drive system without any external protrusions on the wing. While the finished weight of my 36" OhmBrew is around 14 oz. with speed 400 and 7 cell 1100 ma pack. 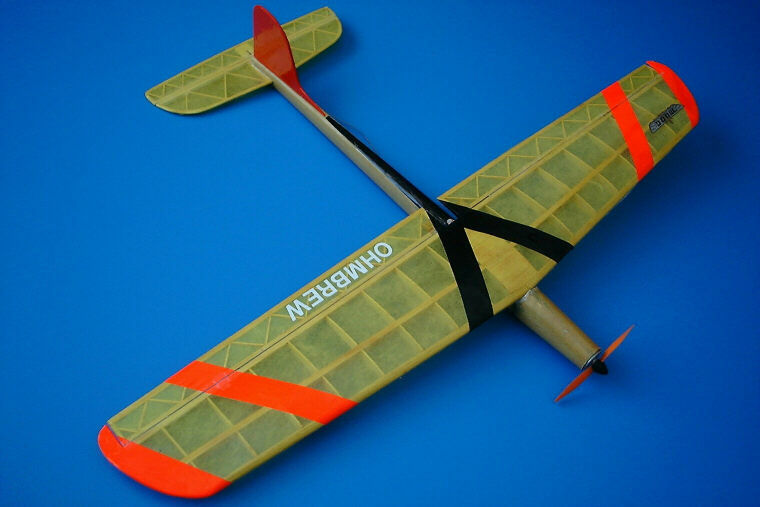 Even in high speed dives and other aerobatics there is no sign of aileron flutter. I am sure the method would work well with heavier models using more powerful servos and wire to 1/16" diameter.